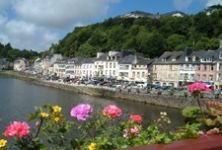 Lying on a loop of the River Aulne, in north-west Brittany, the pretty town of Châteaulin offers a panorama of charming white, stone or pastel coloured, slate-roofed houses interspersed with green trees. Set beside a picturesque river, with gentle hills forming a delightful backdrop, the town attracts a considerable number of visitors in the summer season as it forms an ideal and agreeable base for further exploration of the region, and is situated close to some excellent beaches. The River Aulne is part of the Brest-Nantes inland waterway system, and this adds a very appealing ambience to the town. In the summer season, pleasure boats moor up in the centre of Châteaulin, and a cheerful holiday feeling is imparted. The market is also held beside the river, making what is always a great French experience even more colourful. A mountain, a hill or a volcano? The hill named Menez Hom, the summit of which offers panoramic views of Châteaulin and the surrounding countryside, occasions some debate. It is referred to by some as a mountain, which in Breton terms it may be… though don't try telling that to someone who lives near Mont Blanc! It is also thought to have been a volcano… though you needn't worry about it erupting when you park your car at the top, as it became extinct years ago. Châteaulin is well equipped with shops and amenities. In the town you can find banks, tourist information, hairdressers and a great range of shops catering for almost all foreseeable requirements. Dining out in Châteaulin is an experience not to be missed. There are many excellent restaurants to choose from offering a variety of cuisines. But you would be well advised to choose somewhere that sells fresh seafood, as the town's proximity to the fishing ports of northern Brittany means that the catch of the day really is that fresh! Beautiful as the town is, there will be times when you wish to explore a little further afield, as this area of Brittany is very special. Châteaulin is situated very close to the fascinating Crozon Peninsula, an outcrop of land often described as being like a giant, standing with his arms outstretched to defend the land. Whether or not you subscribe to the comparison, it is an interesting place of great wild beauty, and the cliffs are a distinctive feature of the dramatic Finistère landscape. There are also some beautiful sandy beaches, the nearest to the town being Pentrez Plage. Windsurfers can indulge their sport to their hearts content here, as the conditions are usually perfect. Other sports on offer in the area include riverside walks and cycle rides, horse-riding, golf, tennis and swimming. Fishing is very popular too, with excellent salmon and trout fishing. Fishing permits are available in local bars. As the town is situated in Brittany, ferry travel is an ideal way to reach Châteaulin. The nearest ports are Roscoff and St-Malo. Air travel will get you to Brest, and you can choose to fly with either Ryanair or flybe. Property throughout Brittany has experienced great increases in popularity in recent years, and prices have risen accordingly. Prices in Finistère, however, have risen more slowly than in other parts of Brittany. And because Châteaulin lies slightly inland, property in the town is less expensive than that which is situated directly on the coast, although the sea is still within easy reach. There is a strong rental market here too, as the town is very popular with holidaymakers, although this does tend to drop off a little in the winter. If you are seeking a renovation project this could well be the best part of Brittany for you, as at the time of writing there are some excellent properties of this type available. Chateaulin is a lovely vibrant town with a lot of amenities but retaining it's charm. Do you know Châteaulin better than we do? Do you have photos of Châteaulin? Châteaulin lies in north-west France, in the west of the Finistère department of Brittany, quite close to the coast. Access: By air: Fly into nearby Brest airport with Ryanair or flybe. By boat: The nearest ferry ports are Roscoff and St-Malo. By rail: You can find a connecting service to Brest from London via Paris. Economy: The economy revolves around two main areas. These include food processing, namely of salmon and poultry, and the ever growing tourist trade. Interesting fact: One of the back streets of the town sports a red English telephone kiosk!